During this time numerous transformations occurred that led scholars to suppose that the Khmer Buddhism of today is markedly different from Khmer Buddhism even 2 centuries ago, before the rise of modern Buddhist institutions in Cambodia. - the important role of Buddhist ideas in the articulation of social and ethical values. 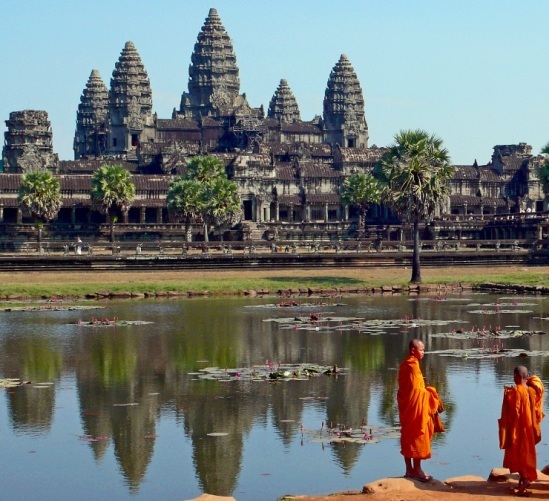 The region known today as Cambodia was inhabited 2 000 years ago by Khmer-speaking peoples who appear to have congregated in small chiefdoms referred to as Funan (Nokor Phnom) by the Chinese. Archaeological evidence suggests that Indian merchants, explorers, and monks imported Buddhism into this region at least as early as the 2nd century C.E. A consensus has emerged among many historians, however, that Indians probably never established a political and economic process akin to modern colonization by Europeans in Southeast Asia; nor is there thought to have been a large-scale movement of Indian emigrants to Southeast Asia. possibly through a combination of economic, diplomatic, and religious contacts both with India and Indians directly, and also through the cultural medium of other Southeast Asian courts and traders. Buddhist and Brahmin practices coexisted and became intertwined with local animist traditions and spirit beliefs in the Khmer regions from the 2nd century onward. Buddhist missionaries and pilgrims were active during this period, which may have contributed to the introduction of Buddhism into Southeast Asian courts. Chinese histories indicate that at least one Buddhist from Funan, a monk named Nāgasena, travelled to China in the 6th century. Chinese monks traveling to India by sea stopped en route to visit many sites in present-day Southeast Asia. While no indigenous Buddhist texts from this early period remain, items discovered by archaeologists at the site of Oc-Eo (meaning "Glass Canal") (a port city during the Funan era) include Buddha images associated with the Mahāyāna tradition. Chinese records from the period describe Buddhist, Śaivite, and spirit cults and practices among the Khmer, with the central court rituals seemingly concerned with devotion to Śiva, especially through the worship of Śiva-lingam. Epigraphic evidence for the Buddhist presence begins to appear in the 7th century, during the period referred to as pre-Angkor, when the Khmer regions were apparently dominated by a group of chiefdoms or kingdoms referred to in Chinese records as Chenla. Recent historiography on the pre-Angkor period resists the tendency of older scholarship to over-interpret limited epigraphic evidence or conflate European or Indian models of Kingship and society onto the Khmer context. Inscriptions from the period, predominantly in Khmer and Sanskrit, suggest that the pre-Angkorian rulers were for the most part devotees of Śiva or Viṣṇu, but this does not mean that an Indian-like “Hinduism” was in existence. Most pre-Angkor rulers appear to have tolerated and to varying degrees supported Buddhism in their courts, but to what extent Buddhism was known beyond the courts is difficult to gauge. Iconography and historical records from the period suggest that Buddhist influences were being felt from India, China, Śrī Lanka, and other parts of Southeast Asia, such as Dvāravatī and Champa, with more than one form of Buddhism in evidence. Numerous Avalokiteśvara figures, as well as a reference to “Lokeśvara” (Avalokiteśvara) appearing in an inscription dated 791 from the Siem Reap area of present-day Cambodia, indicate the presence of Mahāyāna ideas. Yet some early Pāli inscriptions have also been found along with Śrī Lankan and Dvāravatī style Buddha images showing Theravāda influence. By the end of the pre-Angkor period, kings were expanding their territories and centralizing political and economic authority, while at the same time seeking to align themselves with deities perceived to hold universal power. While the exact relationship between king and deity denoted by this phrase remains controversial among scholars, there is no doubt that the power of kings and deities were closely interwoven in a cult that became a model for the later Angkorian kings. was inseparable from their associations with fertility and agriculture, their superior moral status, and their roles as protectors and propagators of religious devotion, associations that were carried into the later Buddhist kingships. This range of powers was embodied in their building projects, typically of reservoirs, images, and mountain temples, such as Angkor Wat, the fabulous temple built by Sūryavarman II (r. 1113-ca. 1150) and dedicated to Viṣṇu. While most of the earlier Angkorian kings were Śaivite or devotees of the combined Śiva-Viṣṇu deity Harihara, Mahāyāna Buddhism was also becoming increasingly intertwined with kingship. Yaśovarman I, regarded as the founder of Angkor (889-910), built 3 hermitages outside of his capital dedicated to Śiva, Viṣṇu, and the Buddha. Rājendravarman II (r. ca. 944-ca. 968), Jayavarman V (r. ca. 968-ca. 1001), Sūryavarman I (r. 1001-1050), and Jayavarman VI (r. 1080-1107) were all patrons of Mahāyāna Buddhism, though their reigns too remained syncretic. The complex reasons for Jayavarman VII’s promotion of Buddhism over other Angkorian cults, some historians suggest, may have stemmed from an apparent estrangement from the Angkor court as well as a period spent in Champa, where Mahāyāna Buddhism was influential. After repelling several bloody Cham invasions, Jayavarman VII responded to the suffering in the aftermath of war with public works intended to embody his compassion: roads, rest houses, hospitals, and reservoirs. His temples Ta Prohm and Preah Kan, built to honour his parents in combination with the goddess of wisdom, Prajñā Pāramitā, and the Bodhisattva Lokeśvara (symbolizing compassion), contained inscriptions enumerating the thousands of people connected with each temple complex. The Bayon temple in the centre of his capital contained a central image of the Buddha, with 4-faced images of the Bodhisattva Lokeśvara on its towers and exteriors. This image has sometimes been interpreted as a likeness of the king as well, possibly representing a Buddhist extension of the devarāja concept to linking of King and Bodhisattva. Following Jayavarman, Buddhism and kingship have remained closely intertwined in Cambodia. During the 11-13th centuries, the same period that Islamization was occurring in maritime Southeast Asia, Theravāda Buddhism rose to prominence throughout mainland Southeast Asia. but historiography in general is moving away from a clear-cut demarcation between Mahāyāna and Theravāda Buddhism in Southeast Asia, as well as the idea that one form of Buddhism simply and rapidly supplanted the other. More likely, given the syncretic traditions in Southeast Asia, different Buddhist ideas and practices became intermingled, just as Buddhism itself became interwoven with spirit worship. but became gradually more influential as the Theravāda kingdoms of Pagan and Sukhothai (in present-day Myanmar and Thailand) developed into larger regional powers. As the dominant influence of Angkor waned, increasing contact with these kingdoms may have contributed to the spread and authority of Theravāda ideas in the Khmer regions. he was ordained in the Mahāvihāra (also known in Southeast Asia as “Sinhalese”) order, a lineage they carried back to Pagan. In post-Angkorian Cambodia, it has been suggested, a backlash against the extravagant Mahāyāna expressions of Jayavarman VII led to a “Hindu revival,” and Theravādins may have used this as an opportunity to assert their own interpretations and practices. During the course of the next 2 centuries, Theravāda Buddhism became assimilated into all levels of Khmer society and synthesized in court and villages with older Brahmin and spirit practices, such as agricultural fertility rites and the worship of neak ta (local spirits). The post-Angkorian or “middle period,” dated from the end of Angkorian influence (the 13-14th centuries) until the mid-19th century, was until recently perceived as one of decline by scholars fixated on the disappearance of the great civilization of Angkor. Pāli replaced Sanskrit as the language of inscriptions and literature; Khmer also came increasingly to be used, and much of the classical Khmer literature was composed during this time. - are reflected in the art, epigraphy, and literature of the period. At Angkor Wat, for instance, a 16th century inscription refers to the merit produced by a royal couple, the king’s subsequent rebirth in Tuṣita heaven, and his resolve to become an Arhat at the time of the Buddha Maitreya. Buddhist iconography from the period focused on the depiction of the Buddha, and vernacular literary compositions such as the Rāmāyaṇa transformed its hero into a Buddhist Bodhisattva. The 18th and much of the 19th centuries in Cambodia were a period of almost continual warfare and unrest, with the Khmer trying to repel invasions from both their Siamese and Vietnamese neighbours. Historical sources from the period suggest that the Buddhist material culture that had been developed during the middle period was widely damaged or destroyed as a result of warfare and social chaos. Beginning in 1848, when Ang Duong (r. 1848-1860) was installed on the Khmer throne by the Siamese, a renovation of Khmer Buddhism was initiated that would last for at least a century. During the rest of the 19th century, Khmer Buddhists rebuilt damaged monasteries and monk-scholars travelled to Bangkok to copy lost manuscripts and study Pāli. - Samtec Sugandhādhipatī Pān (1824-1894), the monk who is attributed with the importation of the Dhammayuttika Nikāya to Cambodia. Both were educated and ordained in Bangkok, which served as the regional centre for Buddhist education during this period. Samtec Sangharāj Dien was captured as a prisoner of war by the Siamese army as a young boy and sent to Bangkok as a slave, where he served in the entourage of Prince Ang Duong. He was ordained as a novice at the age of 11 and by the time he ordained as a monk in 1844, had already won attention for his intellectual pursuits. In 1849 Ang Duong requested that Samtec Sangharāj Dien be sent to Cambodia to head up the restoration of Buddhism in the kingdom, which he undertook until his death in 1913. He resided at Vatt Uṇṇalom in Phnom Penh, the chief Mahanikai temple. Samtec Sugandhādhipatī Pān was born in 1824 in Battambang (a Khmer province under Siamese control until 1907) and was ordained as a novice there. In 1837 he went to Bangkok to study Pāli, and eventually ended up as a student at Wat Bovoranives under Mongkut. The date of his return to Cambodia and the founding of the Dhammayuttika Nikāya in Cambodia has been attributed both to the reigns of Ang Duong and Norodom (r. 1860-1904), either in 1854 or 1864. Under Norodom, Samtec Sugandhādhipatī Pān constructed the seat of the Dhammayuttika Nikāya order at Vatt Bodum Vaddey in Phnom Penh. In the 1880s he sent a delegation of Khmer monks to Ceylon to obtain relics and a Bodhi tree to plant in the new monastery. He died in 1894, with the title of “Samtec Sugandhādhipatī,” the chief of the Dhammayuttika order and the second highest monastic rank in the kingdom. This newly emerging Buddhism had Siamese, Khmer, and French sources and influences. - and modernization in pedagogical methods for Buddhist studies. Early attempts by Nath to introduce print were met with resistance from established Saṅgha officials and led to increasing factionalism between modernists and traditionalists within the Mahanikai that continued into the 1970s. The French administration took on the role of Saṅgha patron in part to foster European models of scientific education but also, fearing Siamese influence, to stem the flow of Khmer Buddhist literati to Bangkok. The modernist agenda also countered the influence of cosmologically oriented Buddhism in the provinces, where French rule in the late 19th century was plagued by peasant insurrections connected with predictions of a Buddhist “righteous ruler” who would usher in the epoch of the Buddha Maitreya. By 1930, when the Buddhist Institute was established under the directorship of French curator Suzanne Karpeles, most of the modern Buddhist institutions in Cambodia were in place. For the next 45 years, the Buddhist Institute led the development of modern Buddhism in Cambodia, issuing frequent publications of critical editions of texts in Khmer and Pāli, as well as scholarly and popular studies related to Buddhism and Khmer literature and history, many of which appeared in its important publication, Kambujasuriyā. Besides its prominent role in articulating a modern Khmer expression of Buddhism, the Buddhist Institute became a site for imagining Khmer nationalism, and monks were among the most prominent dissidents against the French colonial regime. Achar Mean (Son Ngoc Minh) and Achar Sok (Tou Samouth), later leaders of Khmer communism, were both recruited by Karpeles for Buddhist education. Many monks were executed or forced to disrobe, Buddhist monasteries were destroyed or appropriated for other purposes, and Buddhist text collections were discarded. Nearly 2 million people died as a result of Khmer Rouge policies enacted in 1975-1979. Since the Vietnamese invasion of 1979 that brought an end to the Khmer Rouge regime, Buddhism has slowly re-emerged in Cambodia, in some ways resembling pre-1970 Buddhism and in other ways quite altered. The subsequent governments of Cambodia since 1979 have gradually lifted initial restrictions on Buddhist participation and expression, pre-1970 Saṅgha organization has been restored and many temples (Vatt) have been rebuilt, often from contributions from Khmer living in other countries. New an anthropologist research suggests that older strains of Khmer Buddhist thought, such as millenarianism and tensions between modernists and traditionalists, have re-emerged in this new period. Political leaders continue to situate themselves as patrons of the Saṅgha in order to gain legitimacy. On the other hand, the loss of so many monks, intellectuals, and texts, as well as an entire generation of young lay- people raised without any religious education at all, is seen by contemporary Buddhist leaders as a major obstacle to the rebuilding process and an irreparable break with the past. In addition, the traumatic experience of so much of the population has in some cases ushered in new kinds of cynicism and questioning of basic Buddhist truths, such as the efficacy of the law of karma (action). Many seek to remember the dead through merit-making ceremonies or to ease traumatic memories through meditation practice. New global Buddhist ideas in the form of Engaged Buddhism, human rights education, and conflict mediation techniques, taught through the medium of Buddhist concepts, are also reaching contemporary Khmer Buddhists. These marches, known as Dhammayātrā (dharma pilgrimages), have crossed war zones and called attention to injustices in contemporary society.